We've been asked a few times if we are concerned about Ben. Both about how safe we think the BB will be with him and also how a new small, screaming, stinky being coming into his world will effect him. There are a few strategies involved in introducing a new baby to a canine member of the family. The first thing I'll do is bring home some of the BB's clothing or a blanket, so that Ben can have a sniff (and most likely just ignore it, knowing what Ben is normally like). We'll probably do that a few times before we bring the BB home. Next is, just as you'd imagine it, slowly introducing the BB to Ben, and ensuring that Ben is too startled etc. Ben will, of course, probably ignore it. 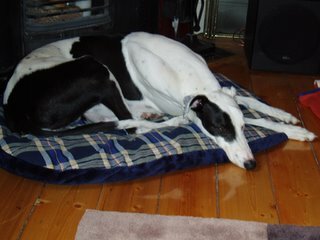 Greyhounds are a remarkably placid breed. The photo (above) is most-likely where Ben is right now as you are reading this. If he had his way, he'd be there 95% of the time (but we do put him out when we aren't here, so he also sleeps on his outdoor bed). Ben has had kids climb all over him, pulling his ears and poking him in the eyes. He's slowly walked away when the time was right, but he's never raised a hackle. I'm actually more concerned once the BB reaches toddler stage, as anyone who has seen Benno bound down our hallway will attest - I'm sure he'll send the BB flying on more than one occasion. But we'll deal with that when it comes. So we aren't concerned, however we will be slow and cautious - for his sake as much as the BB's.